*Please read all listing information before making your reservation. Close to Bellayre and Hunter Ski Mts., just 13-14 miles. 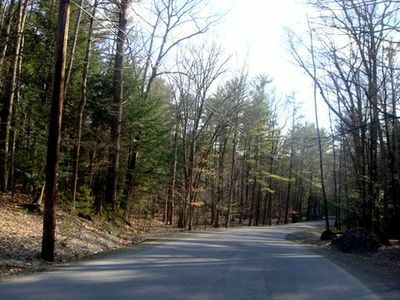 You can walk everywhere in Phoenicia! 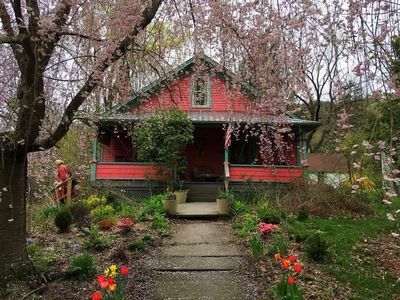 You are in the beautiful Catskills and lovely 1890 Bear cottage is just steps away from the Main St. bus stop, wonderful restaurants, shops, hiking trails, and tubing on the beautiful Esopus creek. 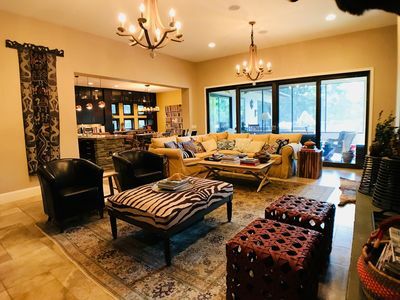 The living room flows from the entry hall and into the dining/library/music room, which is perfect for entertaining, listening to music, playing games and being together. 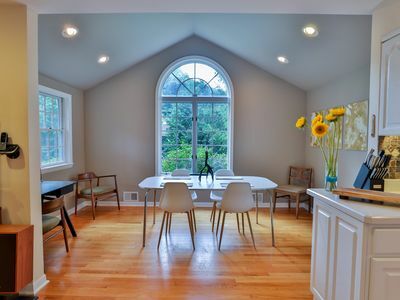 We have a charming country kitchen and it is fully equipped to meet your culinary needs. 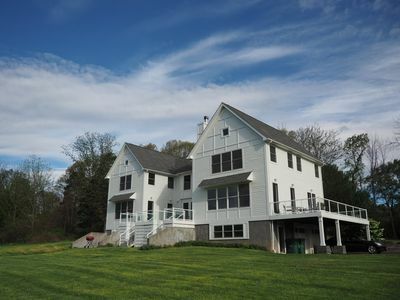 There are two downstairs/1st floor bedrooms, each with a queen sized bed. There are two more upstairs (attic) bedrooms, one has a full/double bed and the other has a queen sized bed and a twin. If you need less space you may rent just the first floor, which is listed simply as "bear cottage". Well mannered pets are allowed with an additional charge $20/dog/night. 2 dog limit. The dog fee will be added to your fee as an alteration. 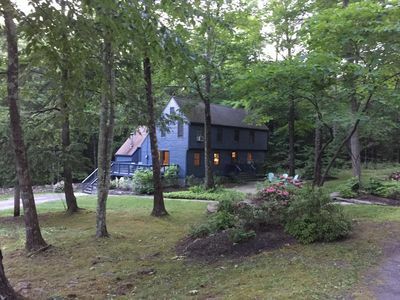 The cottage has Internet, TV (Netflix ready if you have an acct. ), DVD player, CD player, music, books, and movies for guest entertainment. 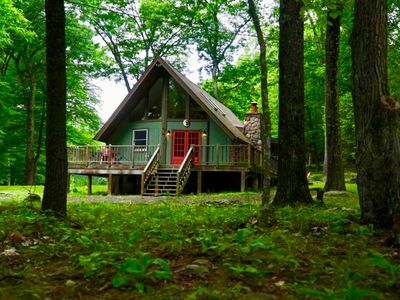 There is no cable at the cottage, but you won't miss it. 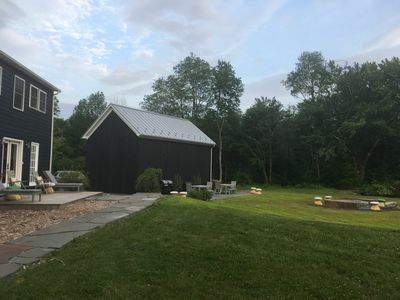 We have a large backyard with a picnic table, front and back porches with rocking chairs, and are close to many outdoor activities such as fly fishing or tubing on the Esopus, skiing at Bellayre or Hunter, or hiking. The festival of voice, an annual concert event, is just two blocks from Bear Cottage. 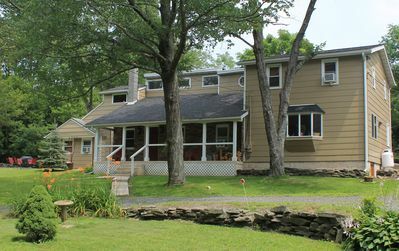 Bear cottage is located in the beautiful hamlet of Phoenicia. 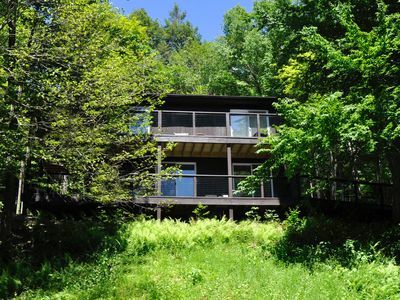 Phoenicia is approximately 2 hours 20 minutes from NYC and 15 minutes from Woodstock and Bellayre Ski Resort. Hunter Mountain Ski Resort is about 20 mins. away. Phoenicia is small, but incredibly charming and there are wonderful shops and restaurants. 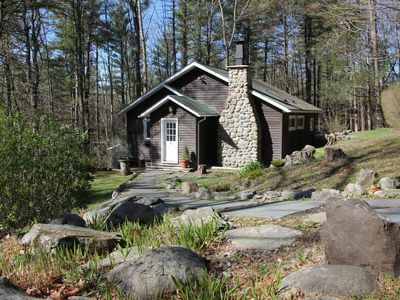 The bus stop for NYC, nearby towns, and ski resorts is less than one block from Bear Cottage. 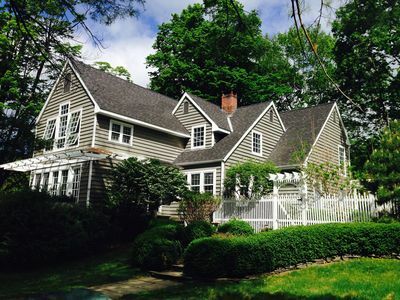 Conveniently located just off of Main St. and just two blocks from the famous Graham & Co. PLEASE BE RESPECTFUL OF NEIGHBORS AND NOISE LEVELS. No outside noise after 10pm, please. 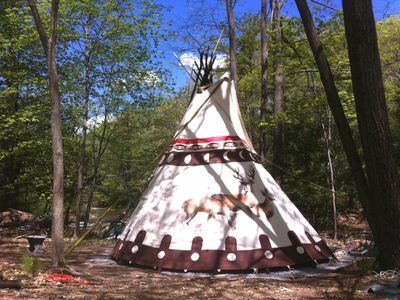 Sioux Tipi Overlooking a Waterfall. One half mile to village of Woodstock. 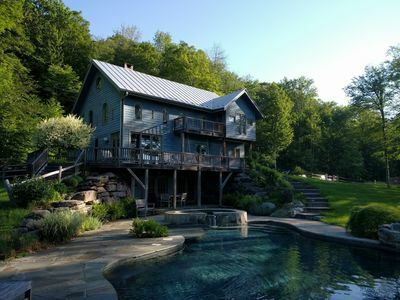 POOL, AC, PRIVATE,PEACEFUL,BEAUTIFUL,NATURE, MAGICAL, YET CLOSE TO EVERYTHING. 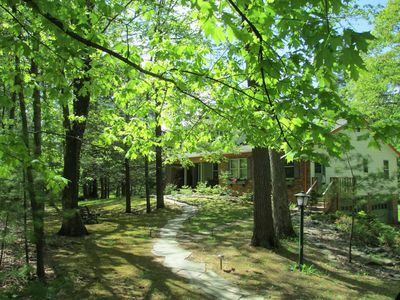 Brookside Retreat: Streamside Patio, Fireplace, Writer's Studio, Walk to Village Green! 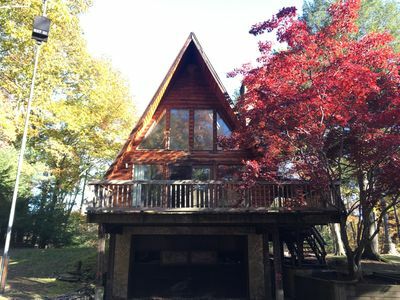 COTTAGE in the WOODS, Access to Pool & Tennis Court, Fireplace, KIDS WELCOME! 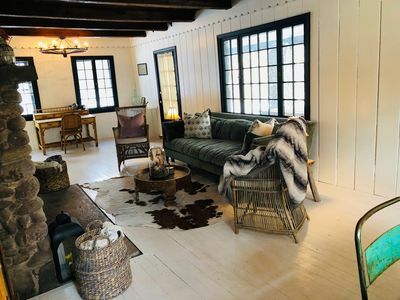 Newly Renovated And Furnished. Near Woodstock, Hunter and Windham ski resorts. 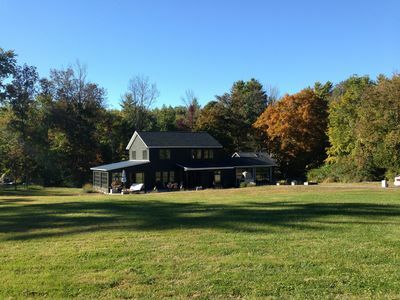 Spacious, secluded loft home on 20 acres. 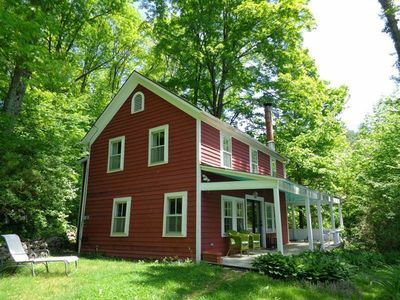 Welcome to Camp Yorkshire, an idyllic Catskill saltbox home on 30 private acres. New! 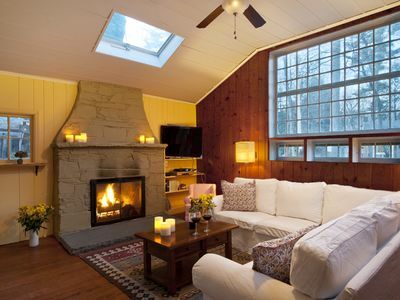 Your Phoenicia Hideaway >>Get cozy by the creek & bring the kids & dog!